Moore Books :: British Mining - Northern Mines Research Society :: New books :: British Mining No 59 - Memoirs 1997. British Mining - Northern Mines Research Society New books British Mining No 59 - Memoirs 1997. 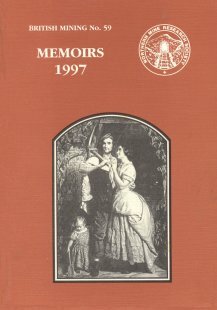 British Mining No 59 - Memoirs 1997. A5, 161pp., 16 photo?s, 38 figs. Recent Exploration of the Milwr Tunnel and Associated Workings, Flintshire; Women workers at British Collieries and the Mines Inspectors; Thomas Dyke and the Brimham Iron Works - A Technological Link between the Weald of Sussex and Kent and Nidderdale; Quernmoor Coal Mines; The Alderson Lead Merchants and Pewterers of London; Mortality rate estimates of Gunnerside lead miners from the censuses; Plankey Mill: A 17th Century Lead Smelting Mill; Fairoak Colliery, Hednesford, Staffordshire; Reverend Rogers? Quest for Mining Riches; Sequel to Reverend Rogers? Quest for Mining Riches; Smeltmills of the Yorkshire Dales - The Grovebeck Mills; Lead Mining in Medi涡l Scotland; Grimebridge, Oldest Pit in Lancashire; A survey of three structures on Grassington Moor, North Yorkshire; Power in Hebden Gill in the mid 19th century; Brereton Collieries.